I don’t know about you, but during the summer, my hair always seems greasier than other seasons. The humidity outside is at an all-time high and I feel like I have to wash my hair every day to make it look clean. But I don’t always have time to shower in the morning, so I’ve enlisted the help of invisible dry shampoo to make my hair look fresh and just-washed on a daily basis. Even if you do have time to shower every day, using heat tools like a hair dryer on top of the scorching summer heat can do major damage to your hair. Heat damage can cause split ends and ruin the natural texture of your locks. The less heat you use, the better, especially in the summer. Dry shampoo uses oil-absorbing powders to eliminate grease and make your hair look textured and clean. It’s pretty much a no wash shampoo that will have your hair looking great, even if there’s been a few days between washings. And if you color your hair, you can even get tinted dry shampoo to help blend in root re-growth! Invisible dry shampoo is my seasonal savior, whether I’ve just finished at the gym, am heading to a dinner meeting or simply need a refresh when I wake up. 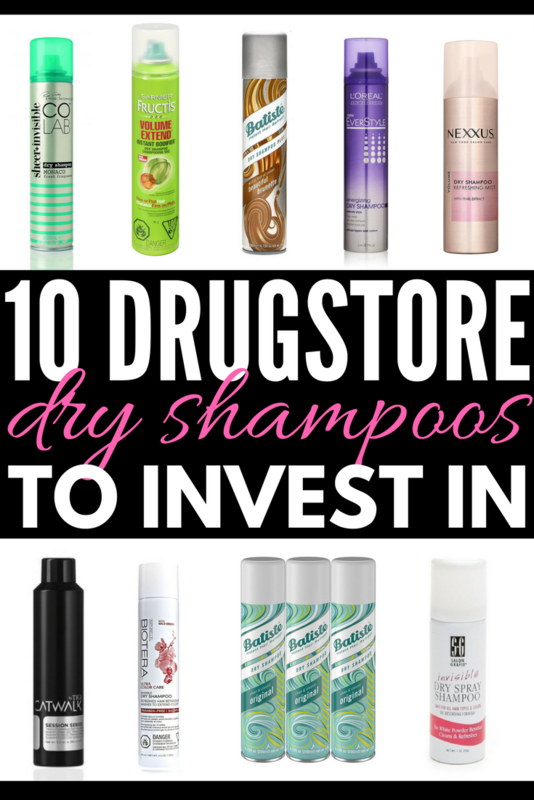 If you’re in the same boat, take a look at 10 drugstore dry shampoos you need in your life. This 100% vegan dry shampoo is formulated with no talc, silicones or synthetic dyes. The oil-absorbent formula refreshes and texturizes dull hair for locks that stay fresh all day. It cleanses and refreshes your locks so it’s easy to style, and also leaves your hair touchable without any build up! Hold it about 8 inches away so you don’t get any white residue. A perfect dry shampoo for color treated hair, this formula is infused with botanicals and citrus extracts to help absorb excess oil. It’s a color-safe product that revitalizes hair between regular washes, so you don’t have to worry about oil or grease. It’s easy to apply and won’t leave excess residue. While some dry shampoos leave a bad odor, this one has a scent you’ll be happy to wake up to when you’re getting ready in the morning. The weightless and invisible formula works well for all hair types and will keep your hair looking and feeling clean between washes. The brand Co-Lab was created by a group of beauty experts who combine the best of their backstage knowledge, so you know their products are top notch! If you’re not into any fragrance coming from your hair products, this fragrance free dry shampoo is the one for you. It will give your roots maximum volume, and absorb excess oils and dirt without over drying your hair. You’ll get instant results with a clean appearance and a light matte finish. With a light, refreshing fragrance and a formula that removes excess oil and grease, Batiste is known as a dry shampoo drugstore must-buy! It will leave your hair full of body and texture, plus it will look and feel clean all day long. Bring it with you to the gym and make sure you have it on the go to spritz when you need it most! Infused with citrus and grape extract, this invisible dry shampoo was formulated especially for those with fine or flat hair. It adds and extends volume for up to 24 hours and immediately revives hair from dull to textured. Simply spray the product onto your hair and comb or brush through to absorb the oil. You’ll get the volume without any excess weight! With Nexxus dry shampoo, not only will you refresh your hair between washes, you’ll also recharge your hair so it can retain its natural movement. The dry shampoo is infused with pearl extract and offers a salon-quality cleanse that extends the life of your hair style. And if you dye your hair, it also helps reduce color fade. If you’re looking for texture and a matte finish for your locks, check out TIGI dry shampoo. It gives you the volume you crave in a lightweight formula and makes your hair extremely manageable. Make sure to shake well before you use it and spray all over your head to refresh your hair while adding volume and texture. If you’ve colored your hair, a dry shampoo with color not only helps keep your hair looking clean and textured, it also helps blend in root re-growth so it’s harder to spot your un-colored roots. Batiste offers colors such as medium to brunette, divine dark, and brilliant blonde, so not matter what shade you colored your hair, you can find a colored dry shampoo that will work for you! For the ideal on-the-go dry shampoo to throw in your purse, gym or travel bag, Salon Grafix dry shampoo has an oil absorbing formula that will leave no white residue. It’s perfect for refreshing and cleansing your hair between normal washes, and it’s easily brushed through to leave hair clean and shiny. If you liked this collection of invisible dry shampoo products, please share it on Pinterest! And if you’re looking for more hair care tips and tricks, please follow our Fab Hair board on Pinterest!